Why not, “Thanks for inviting me,” or “It was a pleasure to join you.” Or even, “You’re welcome,” or “Thanks for giving me a chance to join you.” “Having me” could mean almost anything! At our house, the only formidable garden predator we have succeeded in defeating is Western Washington’s Columbian black-tailed deer. They still wander down the hedgerow and eat an occasional Rosa moyesii ‘Geranium’ bloom or succulent leaf of Salix fargesii. They even come for afternoon naps now and again—usually three does, lying in the shade together. But they have never tried to get into the kitchen garden. A closer look at the deer fence, constructed by Gary and Wesley Schultz, with ‘Sugar Snap Peas’ skirted with scallions on the left and young seedlings of ‘Sugar Buns’ corn just sprouting on the rights. Photo: John Neff. 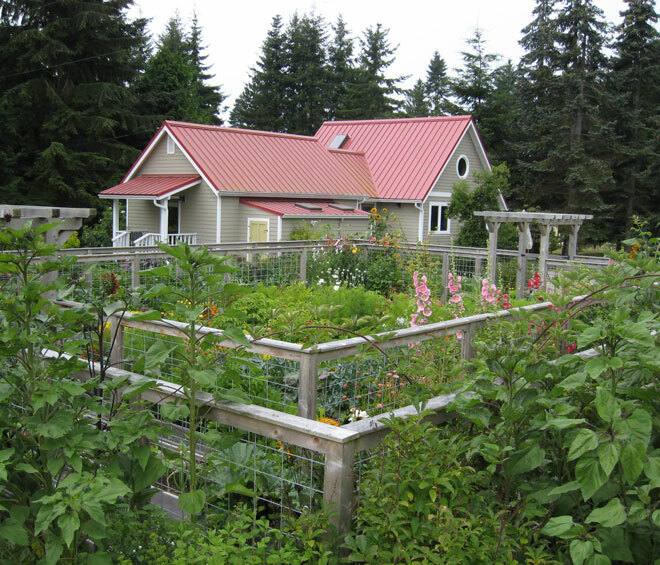 Five years ago, when we moved to this Kitsap Peninsula garden, it was exciting to see that our best sunshine was right in the middle of our fairly narrow, two-acre property. 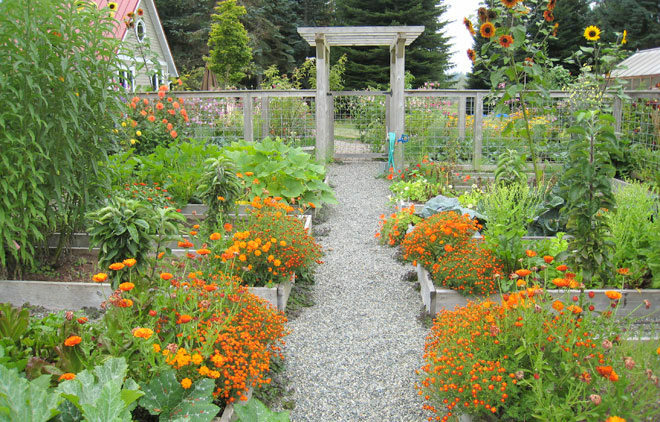 Food in the center of the garden—perfect! 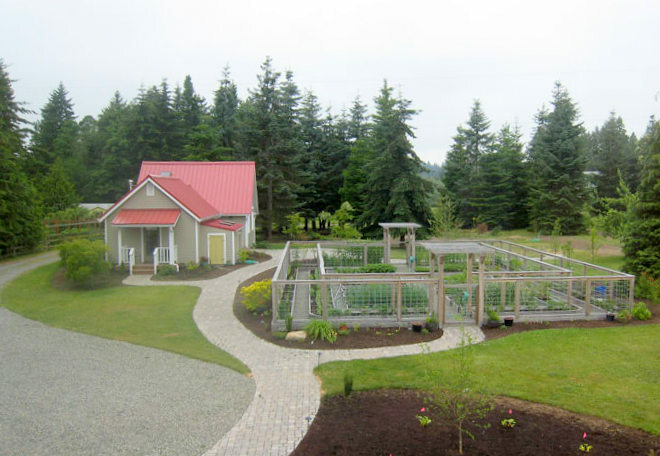 An aerial view shows the placement of the kitchen garden in the middle of the property with the small guest house/home office on the left and Christmas tree shade garden in the distance. But this lovely center of life seemed a poor place for an eight-foot fence made of plastic deer-fencing material. Then I remembered a picture I saw in a magazine some years ago: it included two wooden fences, five feet high, separated by a five-foot gap. The gap was hard-packed soil, as if it might have been used for walking or a dog run, but the caption made it clear that deer could not jump over those two five-foot fences, placed five feet apart. The combination of height and breadth was too difficult for them to attempt. The fences and beds continue all the way around the four sides of the rectangle with a large, central gravel path running the length of the garden, connecting the gates at either end. Within our double fence we’ve built sixteen three-foot by ten-foot beds. Inspired by a May 1997 article in Kitchen Garden magazine, the beds are constructed by screwing the supporting sides into upright posts at each corner and along the length of each planting area. This approach allows us to easily remove a single rotting board without having to redo an entire bed. Each panel of hogwire is attached to the top and bottom fence rails with one-inch galvanized fence staples. The hogwire is framed by 1-inch side stops that are attached to four-by-four posts with galvanized nails. The bottoms of the wooden posts are wrapped with a water barrier fabric to deter rotting. Fences are capped with one by six-inch lumber; gate and arbor support posts are six inches by six inches. 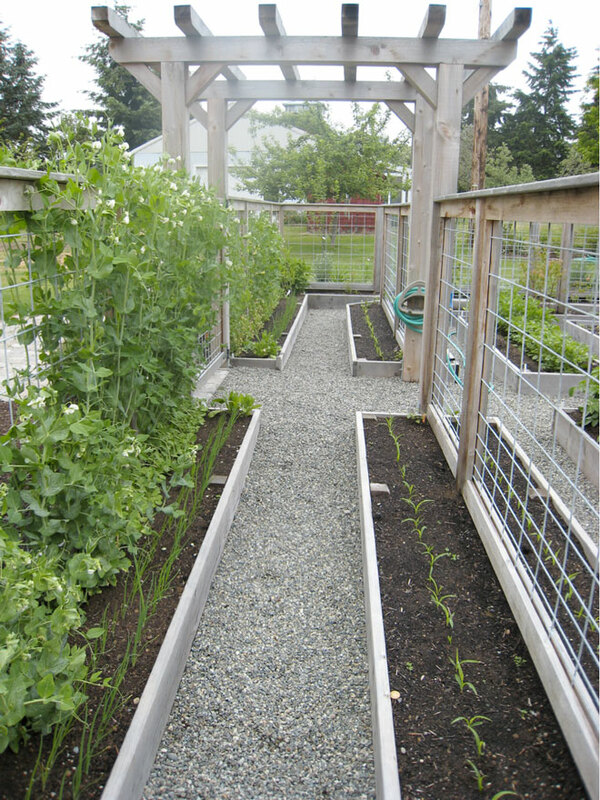 Garden paths are lined with weed barrier and topped with three to four inches of gravel. As it happens, keeping deer out is not the only advantage of our kitchen garden’s design. We have built in trellising for peas, beans, and small pumpkins, such as ‘Jack-Be-Little’ and ‘Baby Boo’. Climbing zucchinis, tomatillos and tomatoes have a firm support to lean on or tie up to, but the large open areas of the fencing do not block air circulation, a healthy benefit in our sometimes damp climate where fungal issues are a constant concern. Slugs and snails are not crazy about trotting across the gravel, but once they find a way inside, they unpack and settle down. Vigilance is still vital. Accurate maps of crop placement for each of the four years we have enjoyed planting our new kitchen garden keeps us from failing to rotate crops carefully. 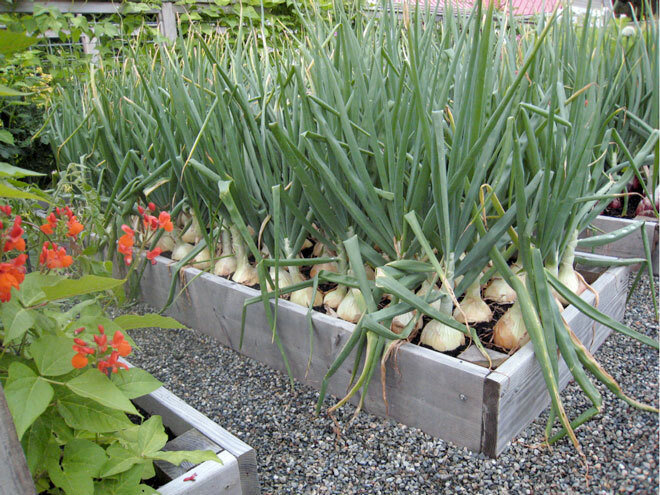 So far, we have enjoyed planting and harvesting good crops of onions and garlic, brassicas of all sorts, potatoes, corn, sorrel, squash, rhubarb, arugula, beans, peas, and even (mostly green) tomatoes.